You may be surprised to learn that prescription opioid (or narcotic) abuse is a big problem in the State of Wisconsin. You are not alone. That’s why the Wisconsin Department of Justice, in conjunction with the Wisconsin Department of Health Services and the Community Coalition of Forest County, is sharing a DOSE OF REALITY and working to prevent prescription painkiller abuse in Wisconsin. When prescribed and used properly, prescription opioid painkillers can offer relief. However, anyone is at risk of becoming addicted, especially our young people ages 12-25. The Community Coalition of Forest County has been working to share this information with our community. 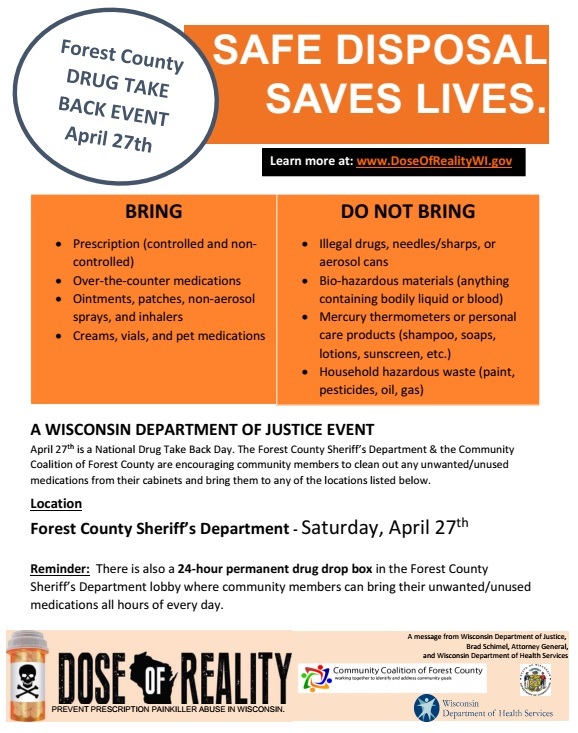 We have displayed a billboard promoting the permanent 24/7 Drug Drop Box located in the Forest County Sheriff’s Department lobby, brought information to health fairs to share with educators and students, hosted Drug Take Back and Sharps Disposal events, attended employee health fairs, assisted with Healthy Living Pow Wows in our local schools, provided personal drug lock boxes to community members, and provided professional speaker presentations at our local schools regarding substance abuse and leadership.